This is highly reductive and, indeed, not true of the eight black-and-white cookies we tasted in search of the ultimate one. The master of uncovering New York’s best food, Robert Sietsema, served as moderator of our investigation, so our findings can be considered somewhat legitimate. Before our taste test, Sietsema tried many more cookies than we did, actually did extensive research, and chose eight highlights for his book, New York in a Dozen Dishes. We tried his picks (minus Ruthy's, which was closed), because we trust him, but we also challenged him to consider another we really like, because we are competitive. What we found was not what we expected. 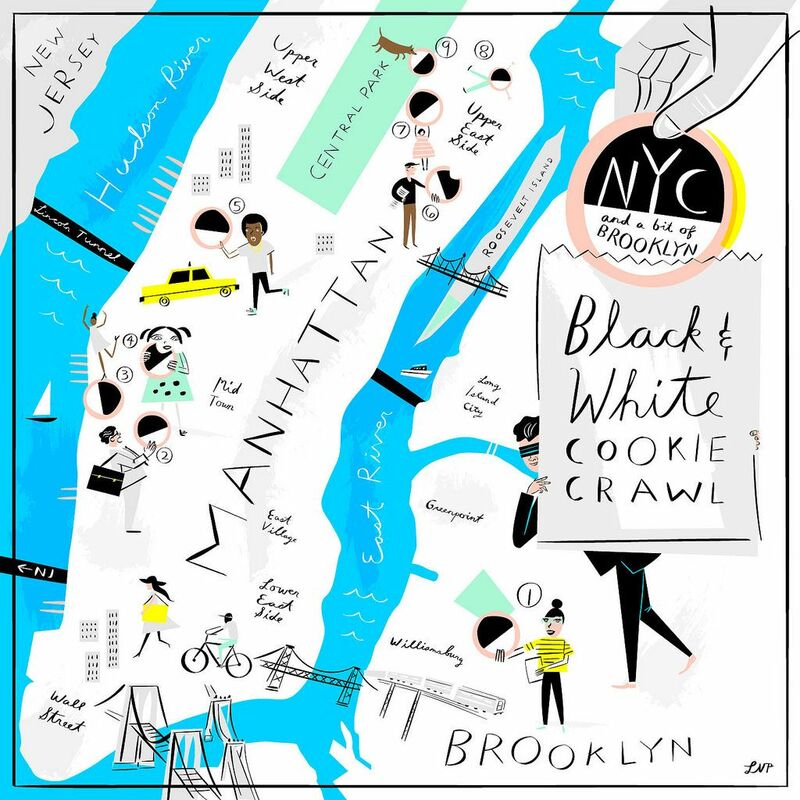 The thing about the black-and-white cookie is that it is one of New York’s defining foods. “No dessert—except perhaps the cheesecake—is more closely associated with the city,” Sietsema writes. So you’d think the city has lots of good options. Think of how many gourmet cupcake shops cropped up when cupcakes were famous for five minutes—the black-and-white cookie has been iconic for closer to a century. Its roots can be traced to Hemstrought’s Bakery in Utica, New York, where they started making half-moon cookies (similarly half black, half white, but with devil’s food cake and buttercream frosting) at the start of the 20th century. 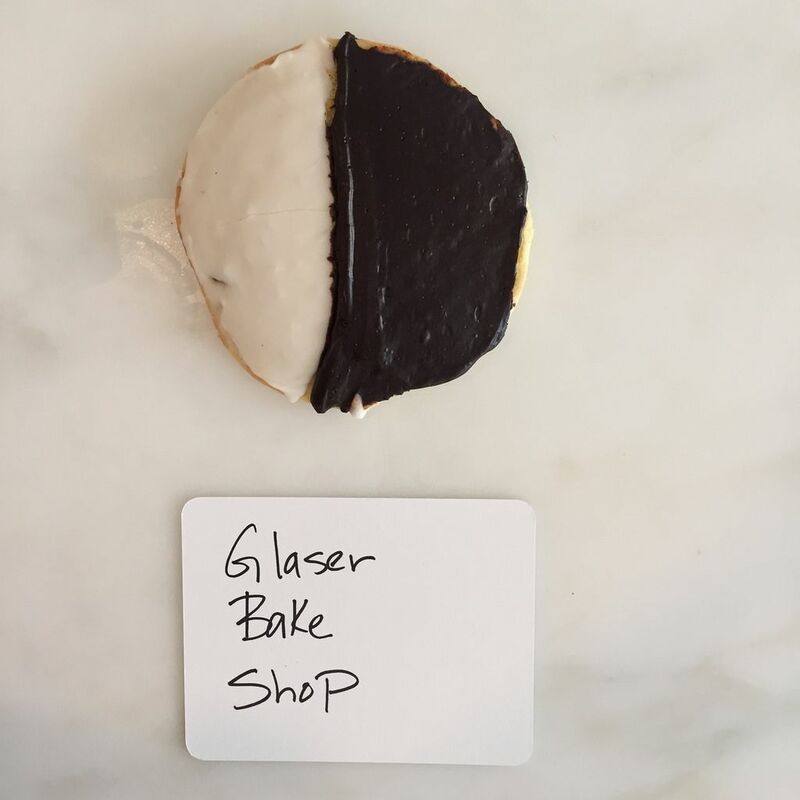 Yes, black-and-white cookies are popular and prevalent: Bakeries, bodegas, Greek diners, coffee shops, and doughnut shops in many boroughs (not to mention nationwide) carry the cookie. They’re usually four inches in diameter and cost around three dollars. You will find colored ones, mini ones, all black or all white ones, and ones with chocolate or coconut or red velvet cake, but we focused on the archetypal rendition—the definition of which quickly became unclear as we tasted. More: Make your own minis. The sugar high, and subsequent crash, was monumental. And after all that pain, our results were inconclusive. Some found Amy’s Bread’s cookie to be the winner: Its cake had a good texture, with lots of air bubbles providing lift. The glaze was beautiful and tasted really good: The chocolate had bitterness and boozy notes, while the vanilla tasted like real vanilla. Then again, is that what a black-and-white cookie is supposed to be? 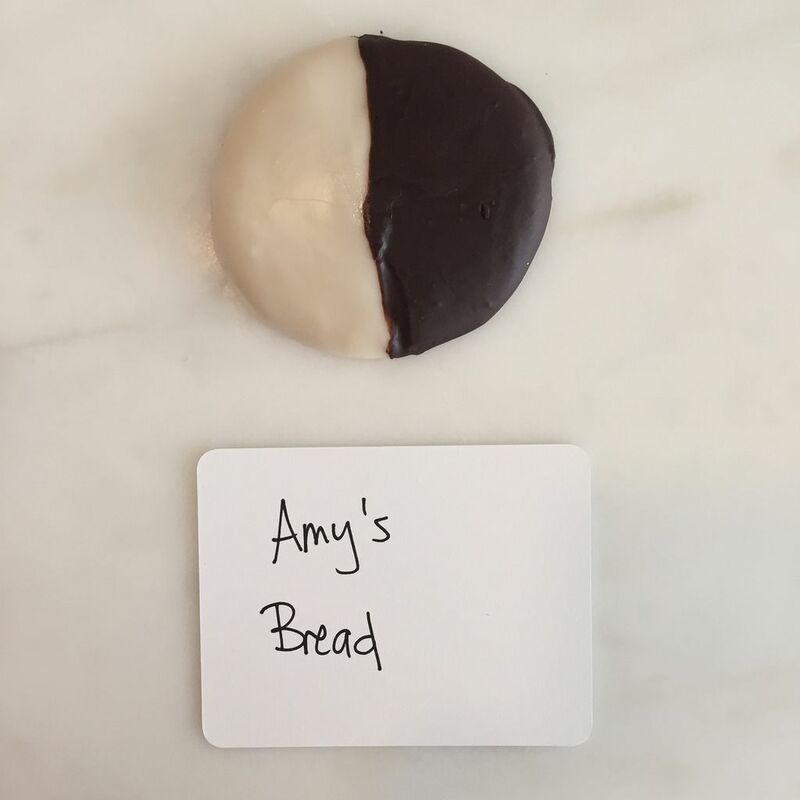 Sietsema says you must consider the terroir: Amy’s Bread is an artisan bakery, yet black-and-white cookies are not traditionally small-batch delicacies (you wouldn’t pit diner coffee against Stumptown coffee, for instance). So if they’re not supposed to be impeccably hand-crafted cookies, what defines a black-and-white cookie? Our findings didn’t help clarify. 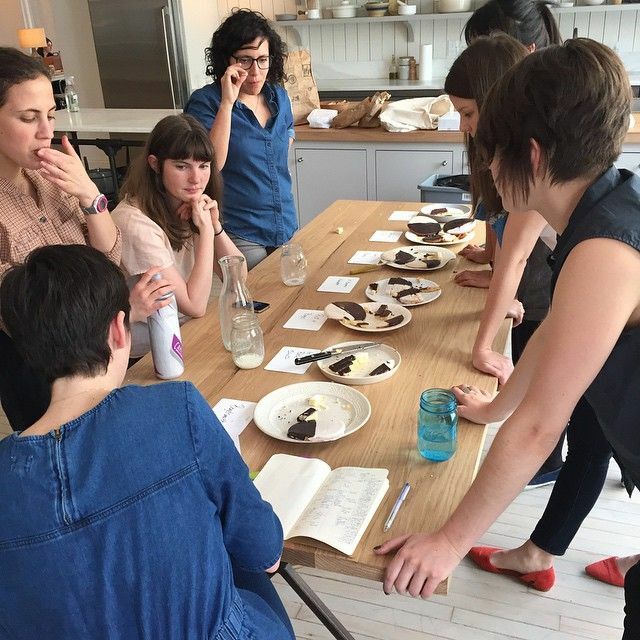 Take the flavor of the fondant (an icing made of sugar and water): Pick a Bagel’s chocolate fondant tasted like it came from a can—“in a good way,” one editor remarked. Some cookies’ colors were purely visual and not responsible for any flavor. Others used real frosting instead of fondant, like Sietsema’s favorite—from the long-standing Glaser's Bake Shop. Sietsema dubbed Glaser’s the best because of its “very fluffy frosting, and the chocolate is more profuse than the vanilla. The cake is plain, suggesting that the frosting is the cookie’s raison d’être.” We, on the other hand, found the glaze job on the cookie to be rough (“lazy glazin’”), the chocolate flavorless, and the intense scent of imitation vanilla to be off-putting. The cake was moist enough to hold together, but dry when eaten. 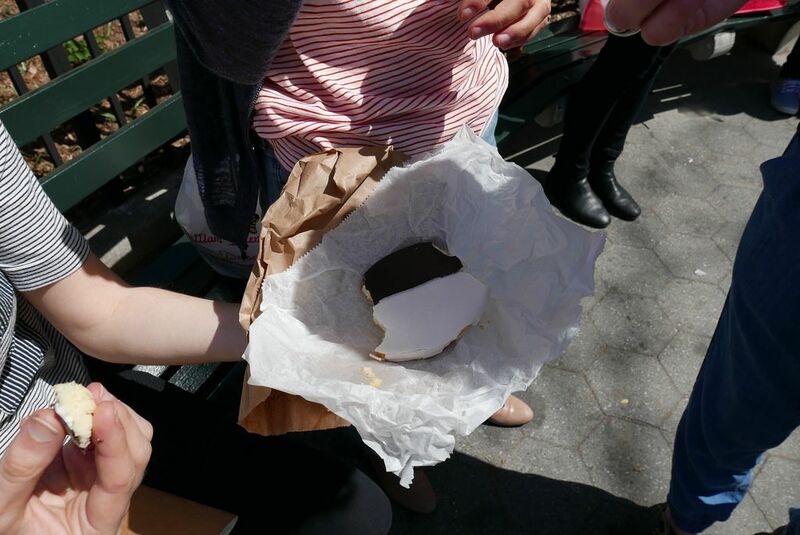 Desperate for conclusions, for decisiveness, we invited Sietsema to visit William Greenberg Dessert, where we thought we'd find our favorite black-and-white cookie. The Upper East Side institution is Glaser’s rival (we’re not afraid of a fight), their minis were wedding favors at our very own Rachel Christensen’s wedding, and we wouldn't be the first to consider crowning their cookie the city’s best—though Sietsema didn’t include the bakery in his book. We ordered a lot of cookies and we tasted. (Robert brought his mask because he still actively reviews restaurants and keeps his appearance unknown. Remember: This was a professional taste test. No fun whatsoever.) The cake was cakey—more cake than cookie—and the fondant was soft. It was good. We liked it. And Robert agreed. But was it the best? William Greenberg: the winning cookie? We still can’t say. 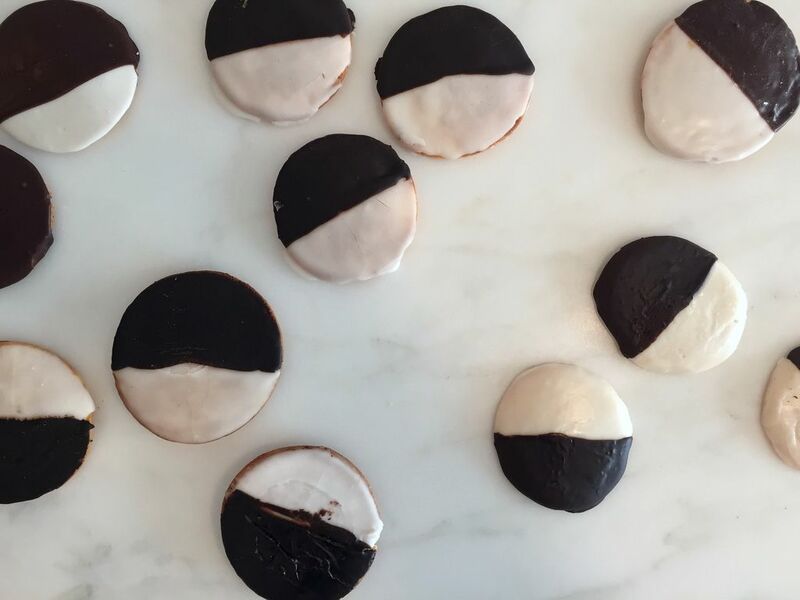 We can’t because—I ask again—what is a black-and-white cookie? Is it supposed to have fondant or frosting, should the fondant/frosting be perfectly half-and-half, should it be flavorful or flavorless? 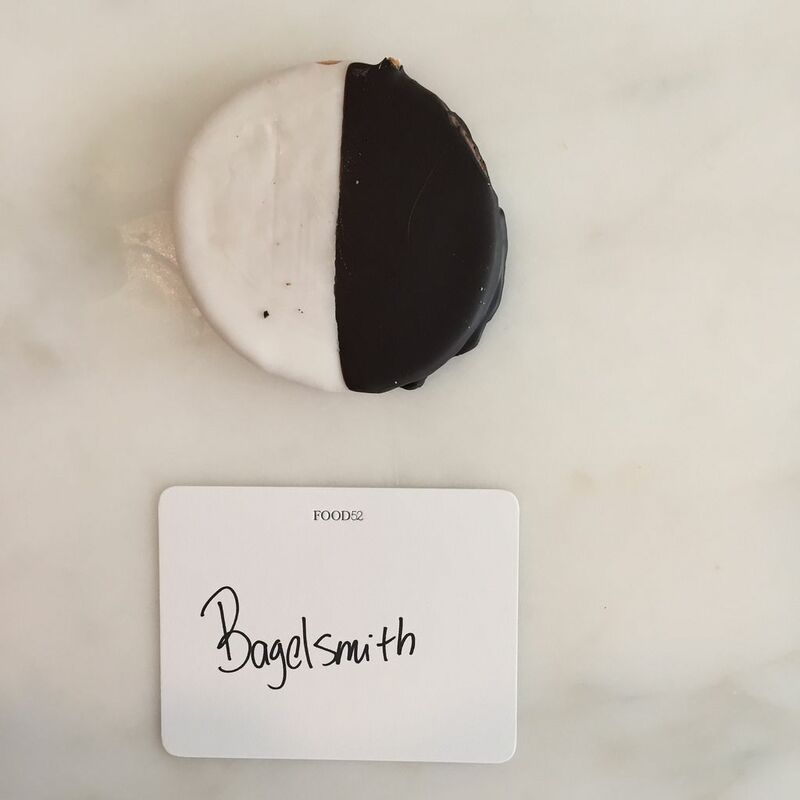 We even found one cookie (from Bagelsmith) where white frosting covered the whole cookie and half had chocolate atop the white, a feature Sietsema says is passed down from the half moon cookie. Then, there’s the cake: Should it be soft, risen, cakey? Or, in the words of Wikipedia, “sponge-cake-like shortbread” (whatever that means)? For now, we’ve given up on picking a best. We’re not quitters, we just need the powers that be to make some decisions about what this classic cookie is supposed to be. Do you know? Let us know. We are now skilled tasters with applicable experience and would like to assist in the cause. Help us out! 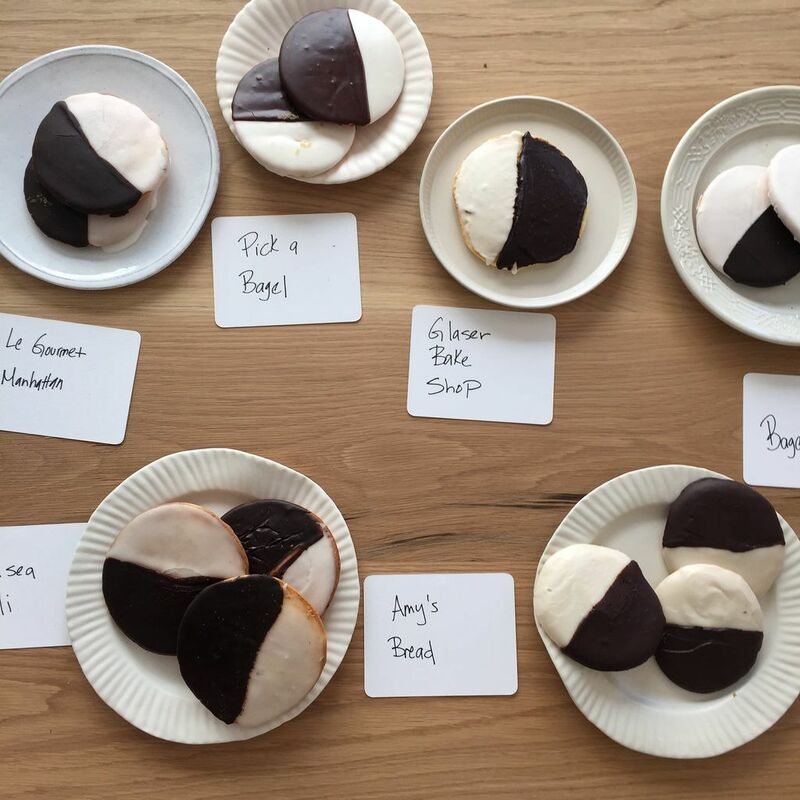 What's the definition of a black-and-white cookie? 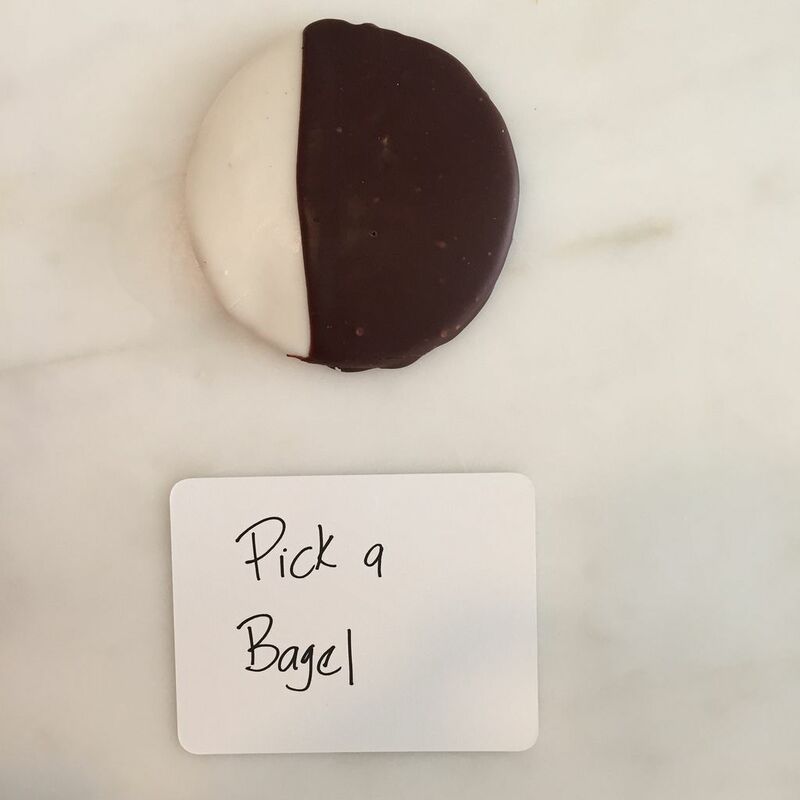 What do you look for in a black-and-white cookie? And, do you have a favorite? lllustration by Libby VanderPloeg; photos by the editors. Why aren't more people mentikning the traditional lemon juice in the white icing (fondant) and sometimes even lemon zest in the cookie!! It's simply not a real B&W without one or both of these things...! Still on my search, trying Glaser's finally today. GLASERS the best. No debate! I have long been obsessed with the black and white cookie. Dated a baker many years ago. He prepared an entire tray of them for me for my birthday, Heaven! He explained that lemon was crucial and it is one important distinguishing characteristic. His black and white cookies were the best but aside from those, I'll take Moishe's. I am now interested in sampling the ones mentioned here. Nussbaum and Wu sound like they are worth the trek. IMO Flakowitz in Jericho NY had the best black and white I ever tasted. Never had one as good. They are closed in that location now but I think have a store in Florida. Nussbaum and Wu on 113th and Broadway. By far the best! No doubt about it....Leske's in Bay Ridge, Brooklyn is the best. My favorite has always been Junior's, I know they're known for their cheesecake, but their B&W cookies are amazing! Scrap your whole story, then go to Zaro's and eat a real B&W. Can't believe you didn't include them! Completely agree. Zaro's is the best. Mother's Bakery in Riverdale A"H, had the best! Actually, Leske's in Bay Ridge has the best black and white cookies. How do write this review without a mention of Nussbaum and Wu? That's like reviewing the best knishes in NYC without mentioning Yona Shimmel. Moishe's is great; but Bagel Boss on First Avenue between 16th & 17th St. also hits the spot! Nussbaum & Wu! Hands down the best B&W in NYC. Bergen Bagels in Brooklyn. I never understood the hype about black and white cookies until I had one of theirs. It's a FONDANT. But not just any fondant. It must be a thickly-packed fondant. And no real NY-er eats the cake part...at least not with any seriousness. It is merely the cud one chews as one ponders the mental film reel produced by the fondant. Nussbaum & Wu on Broadway and W. 113th--the BEST!! Cannot believe it didn't make the cut. Seriously. I completely agree! It has to be Nussbaum and Wu!